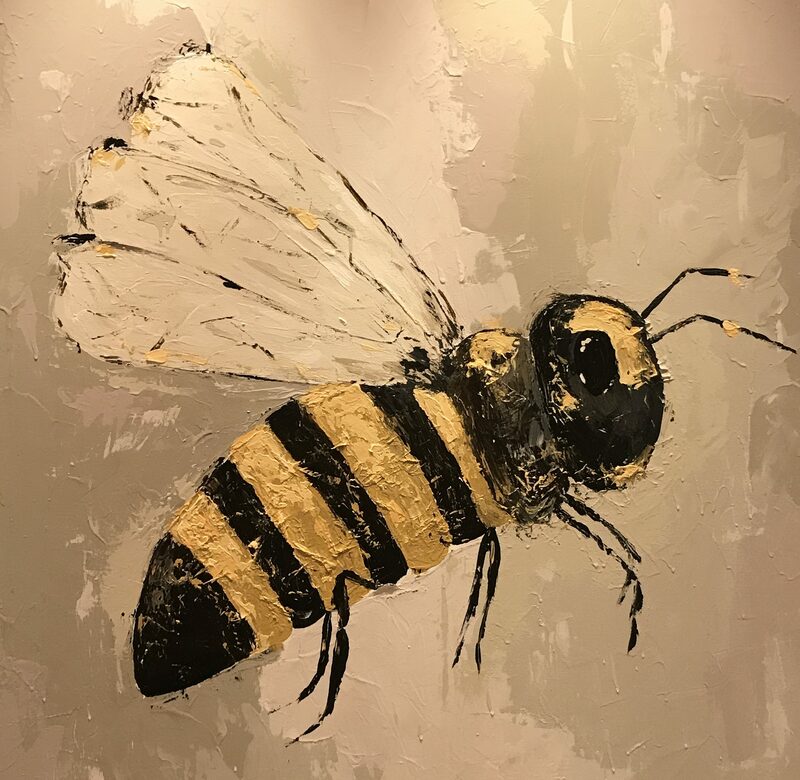 Mary-Catheryn Baker took her time picking up a paintbrush, but now that bold brush strokes are part of her daily practice there’s little chance the West Michigan artist will ever put down her brush. For her 2017 ArtPrize debut, the 33-year-old, self-taught abstract painter created a collection of four paintings based on her memory of spending her formative years in South America where it was common to see her neighbors walking their cows around the block and childhood friends would come over with their family chicken following behind. Her ArtPrize collection is called “Farmed” and is on display at the Gerald R. Ford Museum. 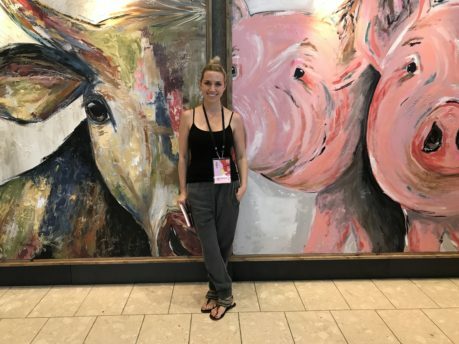 It features 7-foot square, cropped abstract paintings of a cow and two pigs. 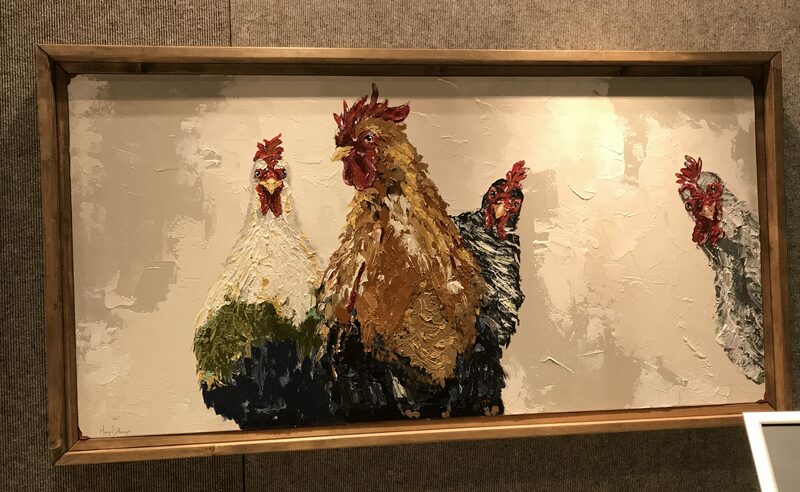 These two big paintings are flanked by a smaller painting of a bee on one side and a group of chickens in the other. All the paintings are heavily textured and larger than life, drawing viewers in- especially children – who can be seen posing for photos in front of the Baker’s entry. On episode 204 of the podcast listen to Baker tell the story of how she started selling paintings before she officially started calling herself an artist. Baker homeschooled herself for the last couple years of high school and didn’t go to art school. She worked for roughly a decade as a medical translator and picked up a paintbrush with the simple intention of making some artwork to add interest to the walls of her own house. 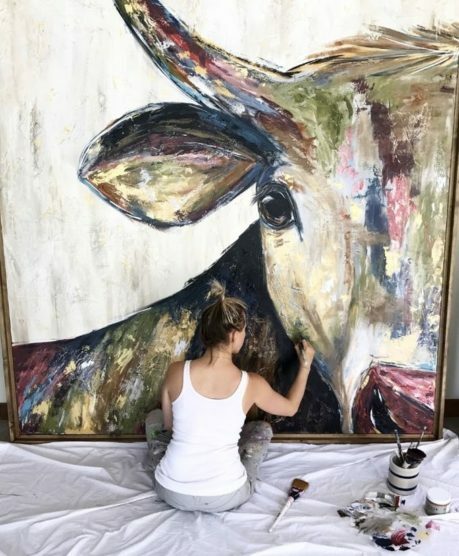 Now, she’s booked more than a year out with commission orders from art collectors near and far who purchase her paintings and prints online through her art business called Copper Corners. Check out her Facebook page here. Baker is a fun story-teller and we covered a lot of ground in our conversation. Tune to hear her talk about growing up while living abroad as the daughter of missionaries, meeting her husband when they were kids and becoming penpals, her former career as a medical translator and how she manages her home studio while simultaneously raising three children under age 6. You can follow Baker’s art adventure on @coppercorners Instagram feed.